A scene at Thursday's "preview party" at MGM Springfield. Visitors outside MGM Springfield on opening day, Friday, August 24, 2018. The MGM Springfield casino from State Street. Sisters Monica Dudley and Bernadette Steward of Greenfield, Massachusetts, said they got in line at 6:00 a.m. for the opening of the new MGM casino on Friday, August 24, 2018. An MGM Springfield shuttle bus loads passengers in downtown Springfield, Massachusetts. The former South End Community Center is now part of MGM Springfield. Kenneth and Linda Radomski of Chicopee, Massachusetts, visiting MGM Springfield on opening day. 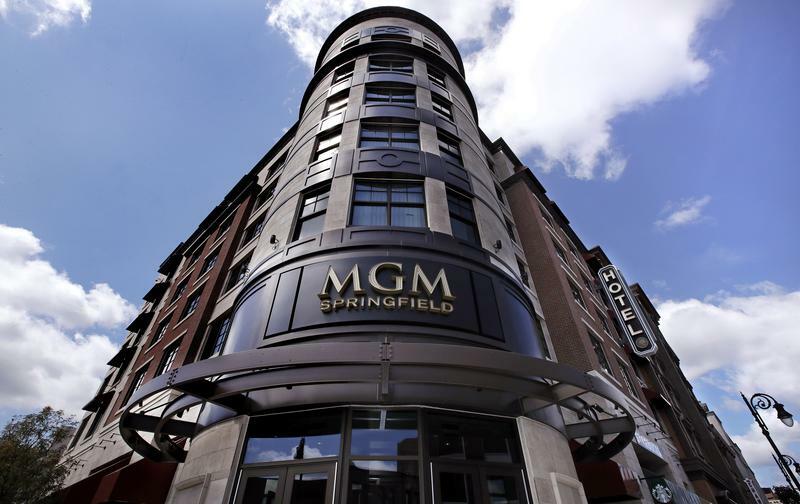 Eddie Krespo of Springfield, Massachusetts, visiting MGM Springfield on opening day. A crowd watches the UMass Minutemen Marching Band on Friday, August 24, 2018. The first resort casino in Massachusetts opened Friday, a $960 million complex in downtown Springfield with expansive Las Vegas-style gambling and entertainment options. MGM Springfield hosted festivities Friday to mark the official opening of the casino complex, including a downtown procession with Budweiser Clydesdale horses and other entertainment. Crowds lined Main Street waiting for a chance to enter the new casino. Sisters Bernadette Stewart and Mona Dudley of Greenfield arrived at 6:00 a.m. Dudley said they like to play the slots. Eddie Krespo of Springfield said he doesn't have much luck, but might play blackjack or roulette once inside. He thinks the casino, with its 3,000 jobs, is a positive development for city and the region. "I think it's good for Springfield," he said. "I think it's going to help the economy and it'll get a lot of people here, create a lot of jobs. It's a real boost for the whole western Mass." Tracy Malley lives in Holyoke. "We've been here since 6:00 a.m. this morning," she said, adding that she wanted to be part of the opening experience. Malley had a more nuanced take on the potential impact of MGM. "You know, it brought in a lot of jobs, and I hope it does for the city of Springfield what they said it was going to do,” she said. “But you know, I'm a little skeptical. We'll see." The 14-acre (5.6-hectare) gambling, hotel, entertainment and retail facility spans three city blocks and is considered the first of its kind for the state. City officials hailed Friday's opening as a significant step forward in Springfield's economic renewal. The new casino occupies a corner of downtown that was hit hard by a major tornado in 2011. Directly across the street from the new casino is Tony's Famous Barbershop. Barber Carmine Manzi said construction work at the casino caused a lot of traffic snarls right in front of Tony's, but Manzi wasn’t complaining. There's a new salon in the casino, and a few blocks south, Emily Cortes stood outside Meche Beauty Salon. Cortes lives in Holoyoke, but is often at Meche. “Sometimes I help out,” she said, since her sister owns it. She said she sees the possible benefits of the casino, like jobs and business in the downtown area, but she worries crime might increase. The MGM Springfield main casino floor is so crowded with people playing slots and blackjack that it is hard to walk around. The chairs are close together so there’s only enough room for one person to pass. And you’re forced to walk through that area today to go anywhere. Next door to the salon, Martin Antonio Valentino was buying scratch tickets and running lottery numbers at Buckeye Brothers Smoke Shop. He's a regular at the coffee and tobacco store that has a number of lottery games. “I play Keno, I play anything that I can make it,” he said. Valentino actually used to live where the casino now stands, before a tornado destroyed his apartment building in 2011. He said he'll probably visit the casino from time to time, but it won't replace Buckeye's. “You go to the casino, you go to Buckeye’s, you go to… over there. Luck is everywhere, you know?” he said. Buckeye's owner David Glantz said the casino's opening day didn't hurt sales at all. "My lottery’s been up today," Glantz said. "You know, people before they’re going to the casino, they’re coming here playing Mega Millions, Powerball, buying scratch tickets." Glantz said he's never seen this level of foot traffic near his store. "I mean, MGM brought a ton of people downtown today," he said. "It’s unbelievable, it’ll be great for business. If it keeps up like this, I’ve got no complaints." Massachusetts legalized casino gambling seven years ago. A more modest slots parlor has been open south of Boston since 2015 and Wynn Resorts promises to open a $2 billion casino development north of Boston next year. Alden Bourne and Sean Teehan contributed to this report, which includes information from The Associated Press. For the first time ever, the influential and iconic Stevie Wonder will play Springfield, Massachusetts.